We’ve been in love with Wine Skins for years. When we travel to wine growing regions around the world, we always take plenty of Wine Skins with us. 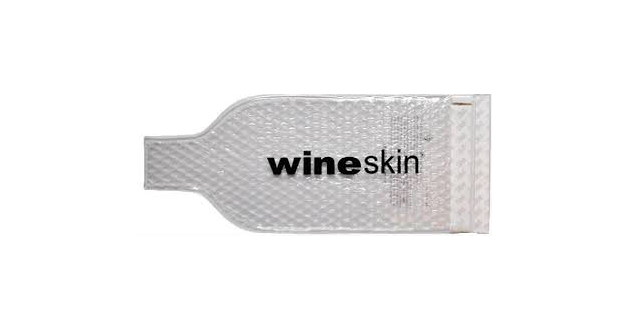 Wine Skins are bottle shaped containers made from flexible, heavy duty plastic lined with bubble wrap. Along the bottom of the Wine Skin is a double row of adhesive tape, so you can securely seal them. Wine Skins protect the wine well, seal or unsealed. Once the Wine Skins are filled, we wrap them in clothes in our luggage for a bit of extra protection. Using Wine Skins, we’ve never had a bottle of wine break. We usually leave them unsealed, so we can use them over and over. The bottles fit tightly enough in the Wine Skin, that you shouldn’t need to seal them. There are imitations out there, but it’s hard to match the quality of the true Wine Skin. While they may cost a bit more, the fact that they’re sturdy and hold up for a long time, makes them an inexpensive way to make sure you’re wine arrives home with you in perfect condition. Wine Skins are available from Amazon.